Android has taken over from Windows as the most popular OS! According to StatCounter, Googles Android OS has now taking over from Microsoft Windows as the most used operating system when it comes to internet usage. 37.93% for Android compared to 37.91% for Windows. This is the beginning of the end of a very long era for Windows. And I'm sure that Android will keep grow and grow. Personally I think that a lot of users will stop using Windows and other desktop OS when technologies like Samsung's DeX Station will be more popular and known to the public. It can handle most of the stuff people use computers for. SAN FRANCISCO & DUBLIN(BUSINESS WIRE)Google’s Android has overtaken Microsoft Windows for the first time as the world’s most popular operating system (OS) in terms of total internet usage across desktop, laptop, tablet and mobile combined. 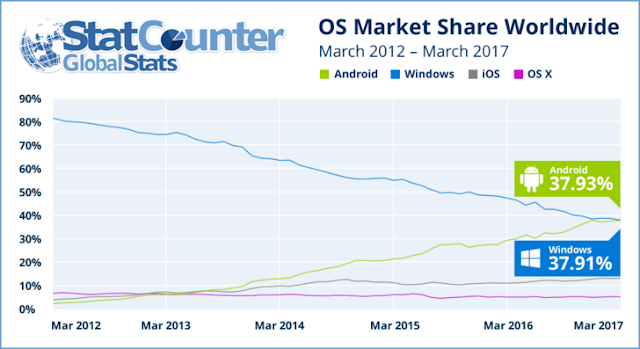 The research arm of StatCounter, the independent web analytics company, finds that in March, Android topped the worldwide OS internet usage market share with 37.93%, which puts it marginally ahead of Windows (37.91%) for the first time. Cullen said that main drivers of the breakthrough were growth of smartphones to access the internet, a decline in sales of traditional PCs and the impact of Asia on the global market. “Windows won the desktop war but the battlefield moved on,” said Cullen. "It will be difficult for Microsoft to make inroads in mobile but the next paradigm shift might give it the opportunity to regain dominance. That could be in Augmented Reality, AI, Voice or Continuum (a product that aims to replace a desktop and smartphone with a single Microsoft powered phone)."